hello everyone, i’m dropping in today to share a layout i did last weekend using goodies from elle’s studio. i used a mix products from Cameron, saltwater and Penelope collection. i am amazed how seamlessly the colors and designs work together. in this layout, i used this photo of ian and ethan to document the boys enjoying the good times, sleeping in and relaxing on a saturday morning. i started with “endless summer” paper from saltwater collection. i hand stitched a heart as a background and used white thread here to keep the stitching subtle. then i added some mist and sequins along the stitching to outline the heart shape. i wanted to add a flower to the layout but couldn’t find a suitable one in my stash so i made one using doilies. i layered the doilies on a piece of round cardstock and added a brad to secure them together. i am surprised how it turned out and i love it! will definitely add this in my future projects. to create a banner so i cut up the labels and cutouts from saltwater and Cameron collection and layer them under the photo. next, i added a ribbon and embellish it with some buttons, wood veneers and my favourite gold foil heart sticker. to finish off the layout, i trim the sides of the “endless summer” paper and adhered it on “bows” paper from the new Penelope collection. I really love your black/white with color combination! Gorgeous layout, love everything about it! Thanks so much lil gik! Oh my...loooove the sequin heart!! Gorgeous layout! So glad to see that you've started a blog! I've been admiring your work since I first saw your layout on Crate Paper blog! Love this layout so much! Hello Cindy! Thanks for your kind comments! 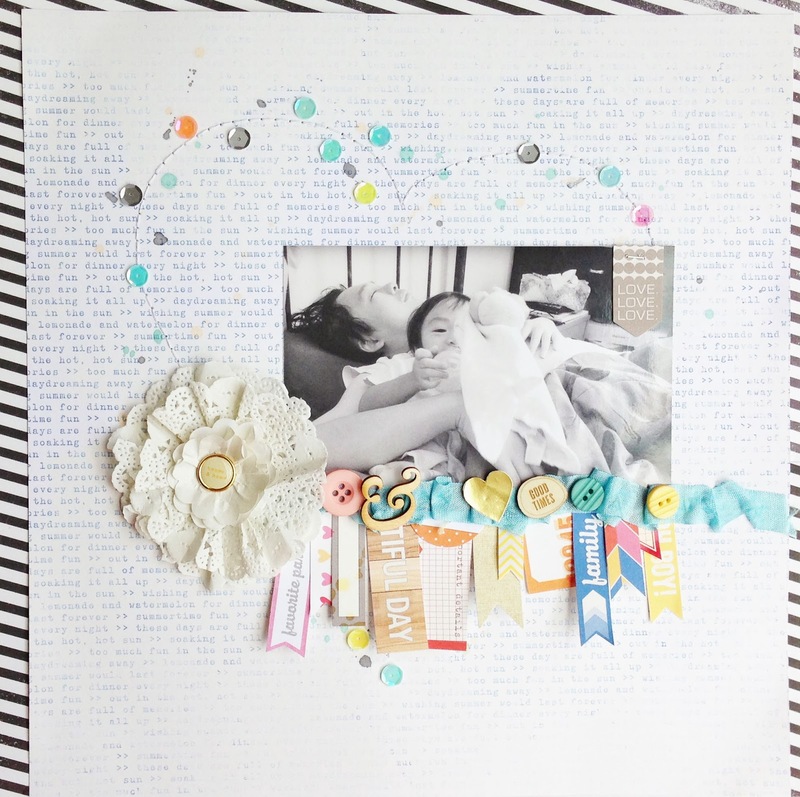 I have been following your blog since I saw your work on crate paper blog too! :) Thanks again for dropping by!